Climate change urges us to make an attitude change. WWF Peru works to bring this topic to the main debate arenas as well as to society through campaigns and advocacy and media actions – carried out hand in hand with authorities and companies – in order to raise awareness on the need to adapt to climate change and mitigate its effects. 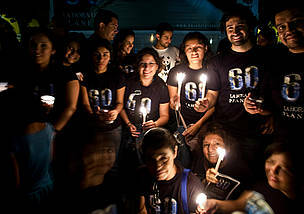 Earth Hour was born in Sydney, Australia in 2007, when 2 200 000 people turned their lights off during sixty seconds to draw attention on the need to face climate change. In its second edition, this WWF initiative became a global phenomenon with over 50 million participants in 370 cities. For 2009, the proposed target was one billion participants in one thousand cities and Peru participated for the first time. On Saturday, March 28th, 2009 at 8: 30 pm from the pyramids of Egypt to the Beijing National Stadium, lights were turned off in a gesture of optimism to face climate change, involving nearly 4000 cities and over one billion participants. In Peru, 40 cities turned their lights off, authorities, artists and businessmen publicly joined the Earth Hour initiative and the most important commercial establishments, monuments, plazas, parks and cathedrals were left in the dark. The Earth Hour in Peru.